The self-publishing business has evolved a lot in the last few years. It is no longer on the fringe but has moved more main-stream. Here is my take on some of what is happening. This will sum up my postings on the editor-self-publishing author relationship based on my talk on the Editors Canada panel April 26. Author has much more say in what is done, can be more satisfying but also lots more work and responsibility and cost. And no middle person for taking cut in book sales. Choice in how to publish (e-publish only or print only or both – Kobo, amazon, etc.). A lot more social media and the like (including doing book review trades with other authors) involved –author blog, Facebook, Linked In, Goodreads, etc. ; author must organize and pay for any in-person book launch, but virtual book launches are becoming popular. 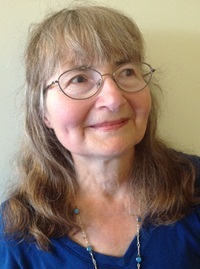 As the title suggests, the author is glued to the seat of her chair at the computer for hours, but she has control over the time and length of her book launch – also much cheaper than in-person launches. Other online media authors can schedule – videos, including guesting on online TV shows such as The Liquid Lunch on thatchannel.com and join meet-up groups such as the Toronto Indie Publishing group. “The process of promoting the book is time-consuming. I try to have it reviewed by friend authors (like yourself), by Midwest Book review (authoritative, free, but it takes about a year) and Goodreaders members. Then I submit the book to all competitions that are not too expensive; I check them first on the website www.pred-ed.com (preditors and editors). Rene’s books have won awards as you can see from the first page of her website. She also has more info on her books and what is happening with them here. And for those who have trade publishers, some of these promotional activities can apply as today published authors have to take their publicity by the horns and do a lot of it themselves. Which is good in that authors can connect more with their readers.